Runde's Room: Can You Catch a Valentine's Day Cootie? Can You Catch a Valentine's Day Cootie? Because I think you're all so sweet, and the little love note comments you leave me make me smile, I've got a little Valentine freebie just for YOU!!! 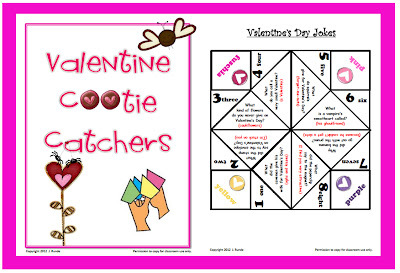 These little Valentine cootie catchers will be so much fun to give to your students on Valentine's Day. Just click on the picture to download your own copy. This is adorable :) Thanks for sharing :) Have a great weekend! LOVE these! Thank you for sharing! Happy Valentine's Day!! This looks like so much fun! I'm sad that we are going to miss our group's Valentine's Day party this year, but we will have to keep this in mind for next year. Thanks so much for the creative idea and for sharing it! Thank you very much! I am going to print them for my kinders 2nd grade buddy class. They will LOVE them! Thanks for sharing! So cute!!! CUTE! Thank you- my students will love these! Thanks so much Jen! YOU ROCK! Thanks, again!!! I've got about a zillion to fold today - thank goodness I've enlisted my oldest to help out. Thanks so much, I am now printing them out for my daughter who is in 3rd grade. I am also thinking of using the blank one for my first graders. These were a hit with my 3rd grade son. Thanks so much! thank you. I am using these today in a little activity for kids. Thanks for sharing this very cute idea! When I stopped here at your blog (via Teach Junkie), I realized that your Smartboard Kooshball activity was my very first TpT purchase, back in 2011! Welcome to Runde's Room! I'm Jen, and I am passionate about teaching and sharing my upper grade classroom ideas and resources here on my blog. I've taught grades 5 - 8 for 15 years, and currently have a split grade 4/5 class. I love creating engaging, fun, and rigorous activities for my students that keep learning fun. I'm also a wife and a mom to three beautiful little girls, and love soaking up every single moment with them. Be sure to follow my blog to join me on my blogging journey. Visit Runde's Room's profile on Pinterest. We're Off to a GREAT Start! All pictures and ideas are copyrighted by and belong to the owner of this blog, Jennifer Runde.